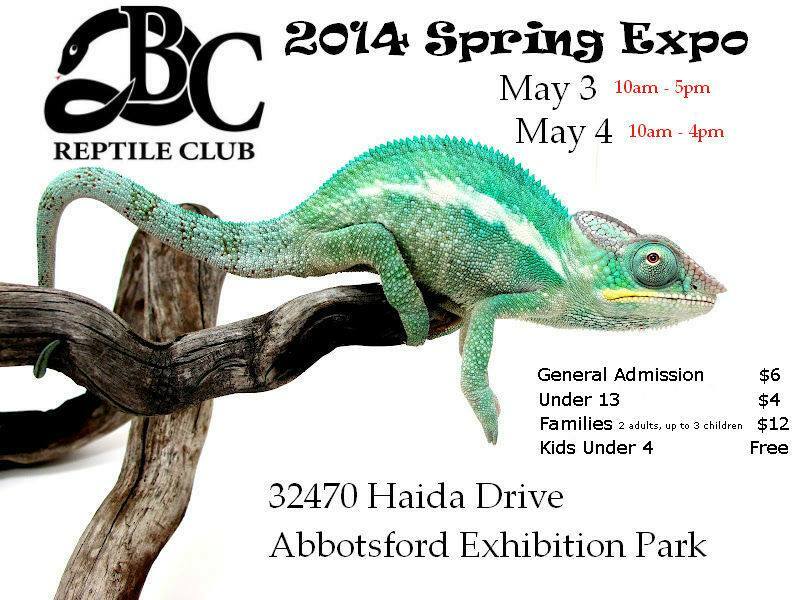 The BC Reptile Club is proud to present our 2014 Spring Expo. If you are ready for some all-ages fun, come see us on May 3rd & 4th! There will be educational displays, amazing reptiles, invertebrates and amphibians, and some of Canada's finest breeders. We also hold a raffle with all proceeds going to a local non-profit reptile rescue. And who knows...you may even come home with a new friend! FEATURING snakes, tarantulas, frogs, geckos, chameleons, bearded dragons, reptile & pet supplies, and way MORE! Too many cool things to list here - you'll have to come check it out for yourself! RSVP on Facebook so you don't miss it, and INVITE ALL YOUR FRIENDS! You can also share the event by going to our website www.bcreptileclub.ca and clicking on "Spring Expo 2014." VENDORS: Tables for the Spring Expo are sold out. If you would like to get on the cancellation list in case a table becomes available, please contact the Secretary via our website. Please note, the vendor list can change at any time without notice.